JessiGeeWhiz Crushed Shells and a DISCOUNT CODE!!!! I hope everyone has had a great weekend. Mine was busy, as usual. Most of the time I would like to just chill and hang out at home, but that rarely ever really happens. Does that happen to you? 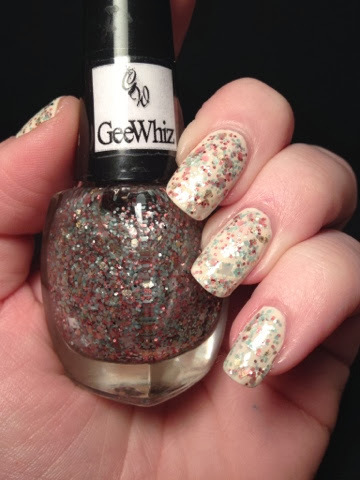 I recently had the opportunity to try out a polish from my friend Jessi over at JessiGeeWhiz. She first got into the market by selling beautiful solvent resistant dry glitter mixes. I have purchased from her before and included some in some giveaway packages. 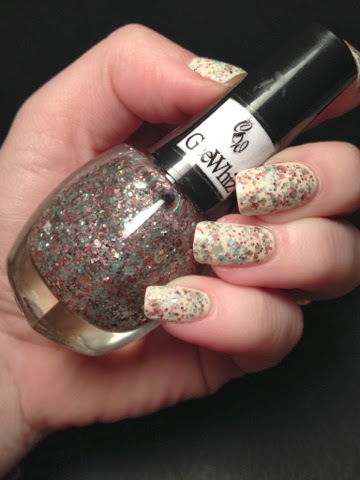 Now, she is branching out and using her glitter mixes in polishes. I was sent Crushed Shells to try. I had her pick out which one to send me as I liked them all. Man does she know me well because the one she sent me suited my perfectly. As a side note, she also does custom work, so send her a message if you are in the market. 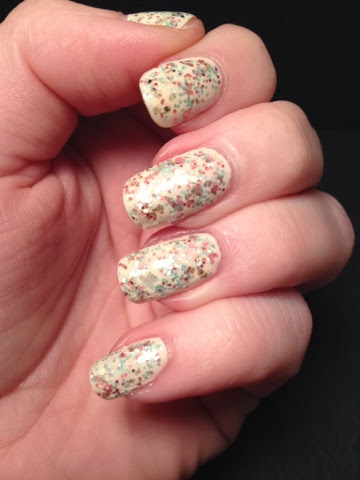 Crushed Shells is packed full of iridescent stars, mint green, copper, gold and pink glitter. So dainty and pretty. It applied easily and I have zero complaints about application. The current bottles may have a stronger odor to them due to the base. However, she is changing bases so that this will not be an issue in the future. I paired Crushed Shells over Maybelline Canary Cool. This is shown with two coats Crushed Shells and two coats Canary Cool topped with Glisten and Glow HK Girl topcoat. Right now her polishes are $6, but don't forget to check her glitter mixes too!!! !